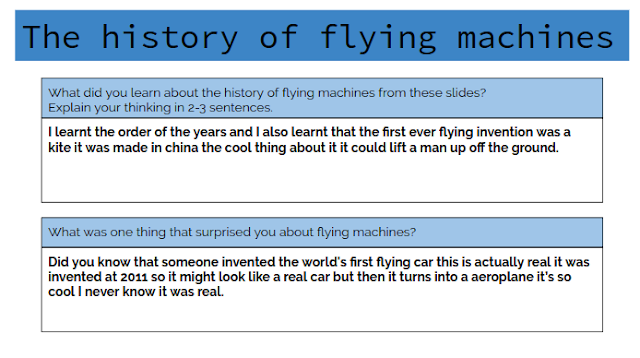 Today I was working on the history of flying machines on a time line we had to work on this I put the slide of the order at the bottom of the page. 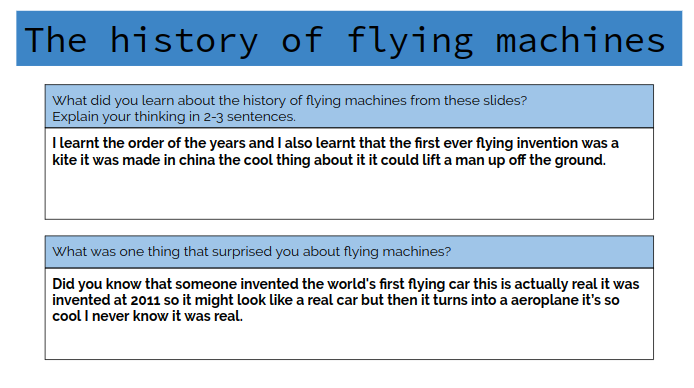 While we have been learning about the forces of flight, we have had the opportunity to make some paper planes. Some of the instructions seemed a bit tricky but we managed to help each other figure it out. We worked out that different designs cause the paper planes to fly in different ways. Only some of them, like the Nakamura Lock, flew a long distance. Our boomerang planes were quite successful. 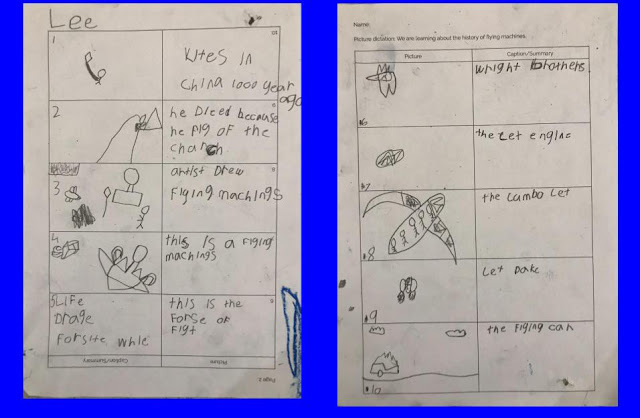 Some of them flew back to us but some ended up landing on the roof of Room 11! We've talked a lot about Matariki stars. Here is one of our sporting stars! Brendon was really excited and proud to receive two certificates at assembly yesterday. First of all he was presented with the Player of the Day award after his Year 5/6 team played rugby against Dilworth on Tuesday. 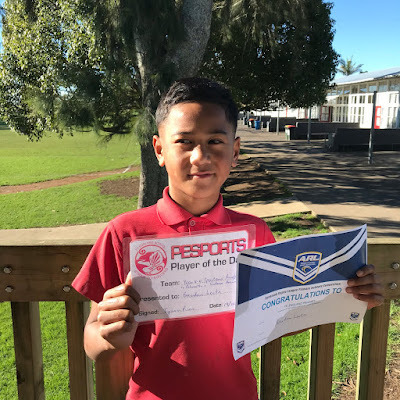 The second award, the big blue certificate, celebrated that his Year 5/6 team won the Auckland Rugby League Primary Schools Competition on Wednesday. What wonderful achievements, Brendon! Last week we drew stars and patterns with wax crayons on our background before turning this into a night sky using water colours. Our night skies began to shine more brightly once we added some vibrant oil pastel stars. After learning lots of skills during Term 2, it was finally time to play a full game of Flag Football at our last Kiwisport session yesterday. Coach Will and Coach Donna have taught us so much: huddle, cadence, snap, scrimmage, touchdown! Such fun! We are learning to work together with people other than our friends when we work in small groups in Room 11. We are trying our best to encourage and support each other by using kind words. We had lots of fun completing a team-building activity today. We had a race to see which group could create the longest paperclip chain in five minutes. However, it wasn't as simple as it sounds! There were some rules: there couldn't be paperclips of the same colour next to each other and, the tougher rule, we were only allowed to use one hand. The other hand had to stay behind our back! Check out the photos to see what an amazing job we did working together on this challenge. 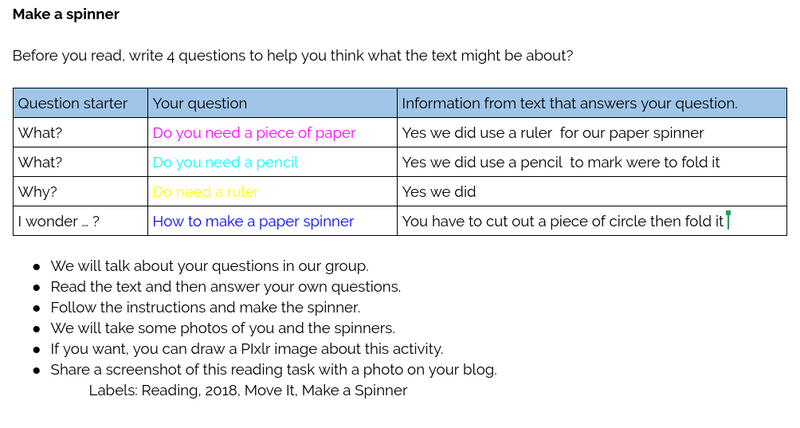 We did lots of talking to come up with strategies to work together to try to complete the task. 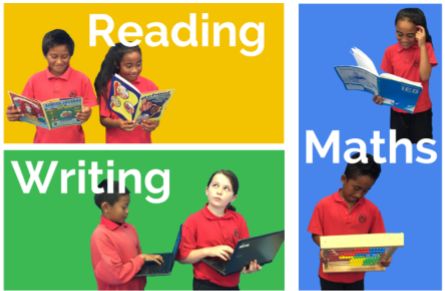 We soon realised that everyone has an important part to play when we are working in a small group. During our whole-school Matariki celebration last Friday, an amazing group of tamariki created kites in Room 11. As it was such a beautiful day, we were able to go outside and test how they flew too. 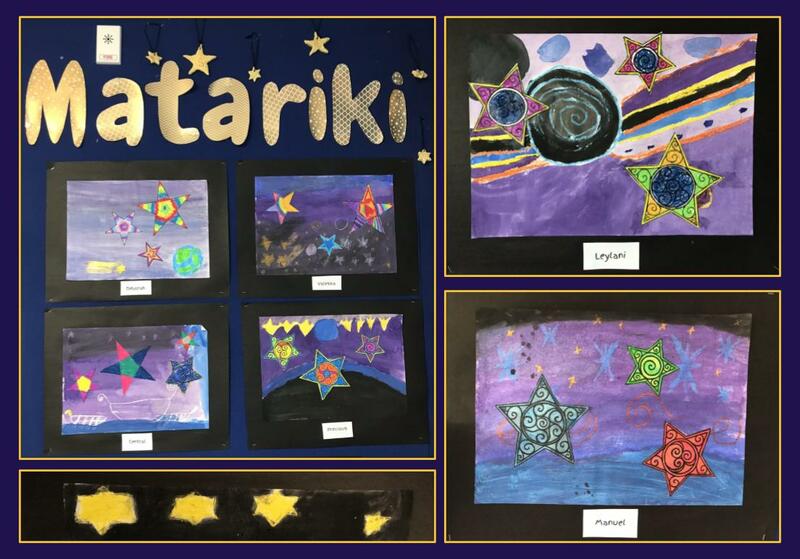 Last Friday was a Matariki celebration day. I went to Room 27 with Ms Gaston and Mrs Carter to make cookies and slime. Matariki is a celebration in Maori culture. It is the Maori new year. In my group first I did cooking. I was with Ms Gaston and Mrs Carter. We made star cookies. First we had to read the instructions. then we made a group and made some cookies. And we had morning tea and then when morning tea was finished we made some Galaxy slime. At the end of the day we ate some cookies and they tasted good. It was amazing fun I had the greatest Matariki day ever. Everyone at PES was split into different groups yesterday for a whole day of fun-filled craft, food or sporting activities to celebrate Matariki. 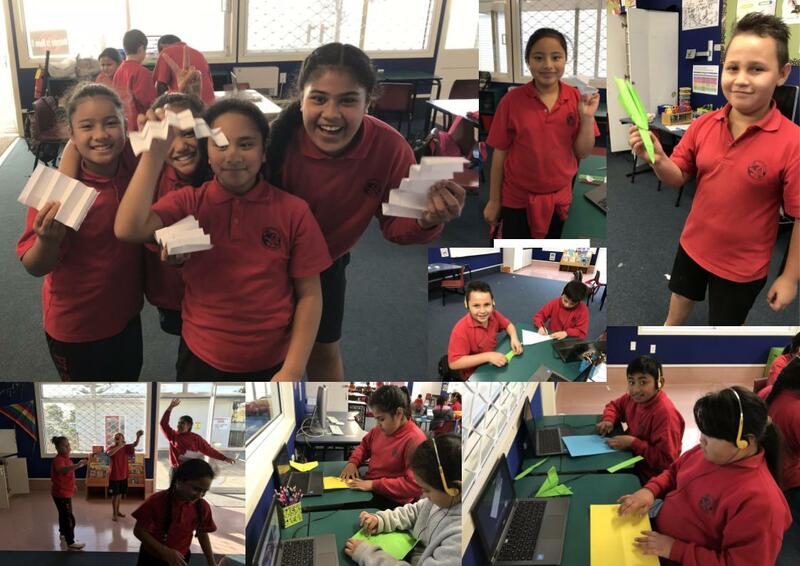 In Room 11 Mrs Stone and Mrs Buchanan organised kite-making. Here Teingoa shows the marvellous triangular kite he created using bamboo, fabric, string and crepe paper. 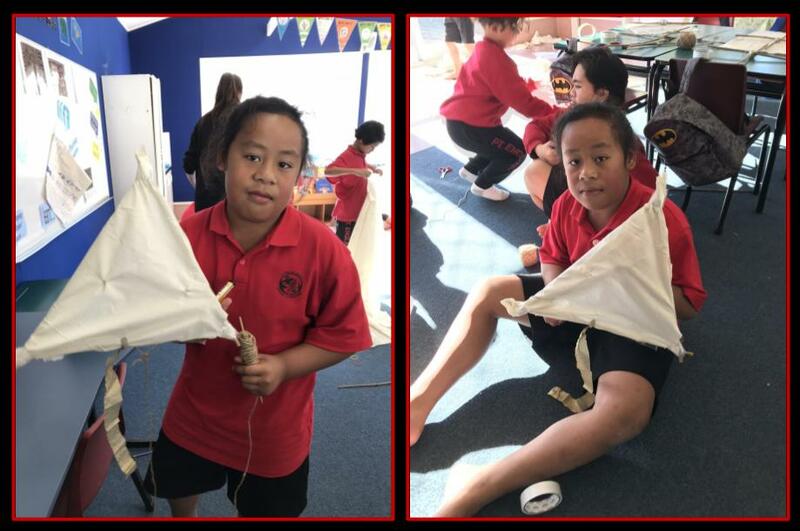 As part of our learning about how things move, we made model parachutes based on the design of Leonardo da Vinci. To do this, we had to create 4 triangles that were the same size. We measured carefully to make the sides of the triangles the correct length. We learnt to use a protractor to measure the angles in the triangles. Here are some photos of us helping each other as we did lots of thinking, measuring and creating. We were so lucky that Point England Kindergarten were able to join us at our school assembly yesterday to celebrate Samoan Language Week. 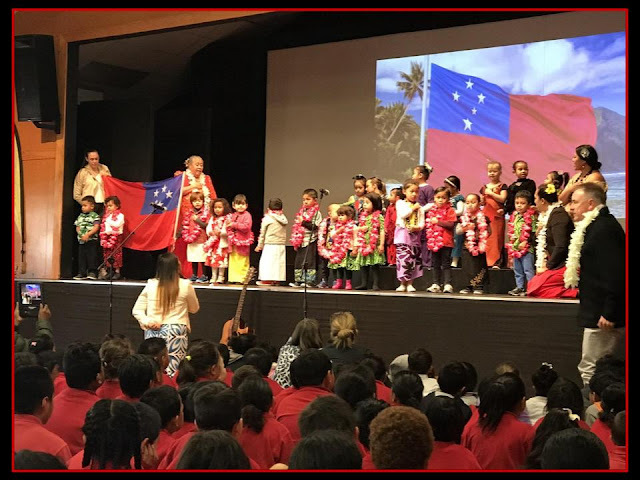 The beautiful tamaiti sang O Le Pepe and other traditional songs at this special event to share with us what they have been learning.